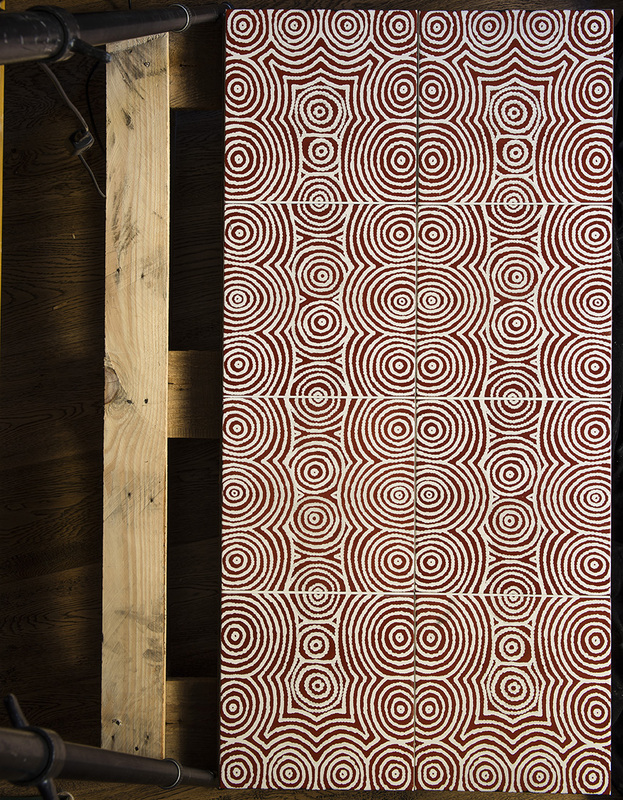 Our inaugural Australian Aboriginal Art Wall Tiles, from original artworks. Design Curial singled us out of 170 national and international exhibitors at Surface Design 2017, introducing some of the most innovative surfaces for the architectural, design and construction industries. Visual language is integral to the Australian Aboriginal culture. Here (as elsewhere) Art is more than the final product that moves us, art is defined by its creative process. Here, all of creation is in relationship, at one with the land, and the artists are in relationship with their community, sharing stories. Whether painted on musical instruments or on canvas, the artists recount mapping myths, rituals and sacred topography – they are metaphors for life's journeys, full of symbolism and references to history, botany, topography and the traditional rural Aboriginal way of life. Bay gallery home's australian aboriginal wallpapers, tiles & rugs exhibited at surface design 2017 and reviewed by architects data file. We are back from London's yearly Surface Design Show full of gratitude for how well we were received. We were even singled out in the Architects Data File as one of the 'best in new surface innovation'. Bush onion, or janmarda, can be found in the river banks and are dug up using digging sticks. The Aboriginal people wait for the leaves to dry out before eating it. So long as the bulb is white inside, it will be eaten raw or cooked. Through her painting, the tile artist Sarah Napurrula White is telling a Bush Onion Dreaming, or Janmarda Jukurrpa. One of the main sites for this story is Purrupurru, in the remote red centre of Australia, where you can see an old Jungarrayi man in the form of a large stone figure. Sarah also likes to paint Bush Onion Dreamings because she likes the designs and patterns. When she’s not painting, Sarah works for the aged and children, and on weekends she loves to go hunting with the old people. The majority of our artists are women who play an active role in their communities, not only practically but in building communal ties through the visual language of Dreamtime painting. With their geometric harmony, these ceramic tiles lend themselves to versatile use, from en masse styling as a splash back, to design feature in our bespoke furniture range. Bush Onion 1 beautifully offsetting modern minimalism.